“Going on.” We all know what those two words mean, it is what we do day after day after day. Some days the monotony of going on and on and on is broken up by birth or love or death or war or natural disaster – and when that happens our bodies and minds usually rebel and scream for the routine to return, and fast! In the theatre “going on” is the phrase used to denote an understudy performance. Correctly used in a sentence: “I’m going on for Meryl Streep tonight because she was hit by a bus.” While understudies live for their chances to go on, they also dread it. When I was growing up in New York City, long before the invention of cell phones, an announcement made over the loud speaker system just as the house went dark meant only one thing: bad news. Someone you’d paid good money to see was sick and someone you’d never heard of was going on in the role. Such an announcement was always greated with a collective groan followed by the angry buzz of patrons debating whether to storm the box office to demand a refund. Imagine being the understudy standing in the wings listening to THAT sound! When actress Elizabeth Richardson was 21, back in the late 1970′s, she toured with a double bill of Chekhov’ “Uncle Vanya” and Noel Coward’s “Present Laughter” starring Peter O’Toole. She was the understudy to ALL the female roles in both plays. In the past decade, she spent three years in an intensive Buddhist retreat and her mother died. Going On is her autobiographical hour long one-woman show, originally directed by Stuart Cox, about all of that, and more. It is touching and funny and insightful. And you have exactly four chances to see it at the tiny and remarkable Church of St. John in the Wilderness in Copake Falls, NY, under the auspices of Carl Ritchie’s Taconic Stage Company. Richardson has crafted a compact and entertaining abbrevation of what has been going on in her life and what keeps her going on today. Theatre and her Buddhist practice are the two central themes, but family cannot help but intrude. We learn that Richardson, one of three children, came from a close knit family and that she was close with her mother, who died about five years ago. Her mother understands and supports her life in the theatre but is perplexed by her Buddhism, especially her decision to embark on a three year retreat, one that shut her away from the outside world on a desolate cliff in Cape Breton. 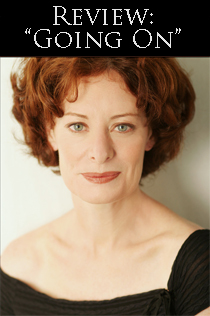 Richardson plays many roles, male and female, in the course of the play, and in the theatrical portions she borrows heavily from Chekhov and Coward, performing both the female roles she understudyed and doing her impression of Peter O’Toole as Uncle Vanya and Gary Essendine. That Chekov has insightful comments on life and Coward has the same on the theatre come as no surprise. Life as an actress is tenuous and isolating in ways that magnify that fact that all of our exisitences teeter on that razor’s edge. Richardson’s later decision to focus on her self in a different light through meditation makes perfect sense. I am neither an actress nor a Buddhist, but I found much wisdom and hope in Richardson’s story and was glad to share the hour with her. I think you will be too. For several summers the Copake crowd has been treated to Ritchie’s own hilarious musical revues as well as one-woman shows like this starring his talented actor friends from throughout his life in the theatre. Ritchie is not elderly by any means, but he has lived long enough to have amassed, as he put it, a stable of talented lady friends, many of whom has been willing and able to spend a couple of late summer weekends in Columbia County presenting their work. As I waited for the show to begin, I chatted with a gentleman seated near me who remarked that Ritchie’s frequent presentation of his old acting chums’ work is, “…such a lovely gift to the Copake community.” He’s right, and I would encourage those of you who live close enough to Copake to make a visit. The Church is miniscule, and so the set consists of a chair and a platform on which a meditation pillow sits. There are theatrical lights and some audio involved, which are ably operated by from a side pew by stage managers Joe Sledz and Sam Spragis. 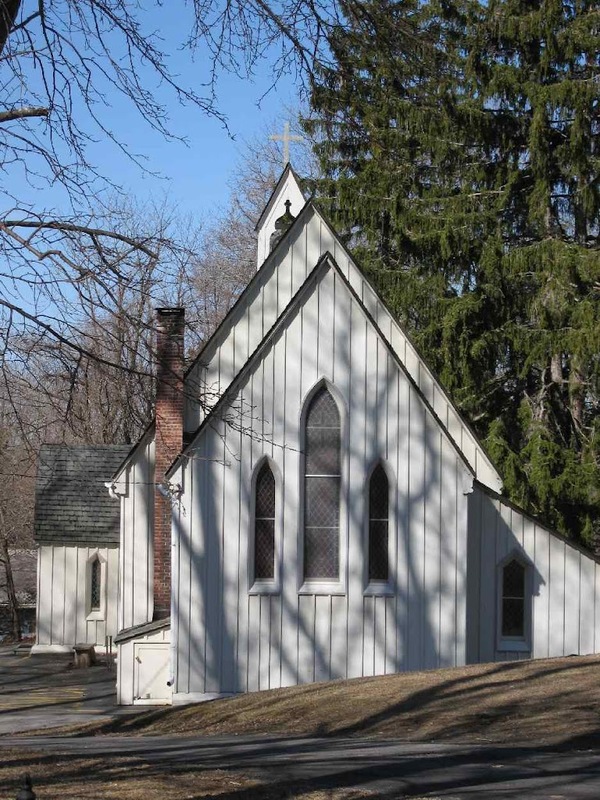 The charming 1852 Church of St. John in the Wilderness* was designed in the Gothic Revival style by Richard Upjohn who designed many other churches, the most famous of which is New York’s Trinity (Wall Street.) He also founded the American Institute of Architects in 1857. It is just down the road from the Taconic State Park and Bash-Bish Falls on the NY/MA border, so an hour at the theatre is easily combined with a day of hiking and picnicking. * The one burning question that two visits to the Church have not yet answered for me is this: Just who, or what, is in the wilderness? The Church? St. John? Or both?